S.N. (Stan) Bronstein has published five fiction novels. The first three are a trilogy of adult crime stories based in Miami Beach called The Fairlington Lavender Detective Series. 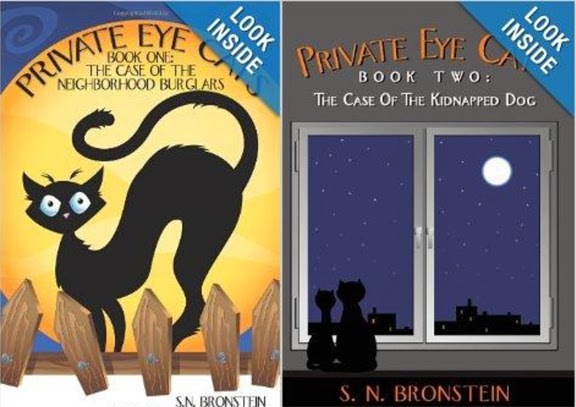 His most recent works are called Private Eye Cats and there are now two books in the series available. I recently discussed his most recent novels, which are written for children aged 9-12, with him. Lou: Why did you switch your genre from adult to children’s books? Lou: How did you do that in Private Eye Cats? Stan: I accomplished this by writing the stories without violence in the plot, and by using the theme of two ordinary house cats who happen to speak English and who find themselves in the unique position of taking on the role of private detectives. The cats are serious about solving neighborhood crimes but they interact throughout the book with age appropriate humor. Lou: What captures children’s interest in the books? Stan: Scooter and Nugget, the two main characters in the books, are sisters. They live in Miami Beach with their ‘humans’, and as in all families there is sibling rivalry. Scooter is older, wiser, and a mentor to Nugget. She reels Nugget in when she goes too far and Nugget injects youthful humor into the story when Scooter gets too serious. The interplay between the two cats as they go about their crime-fighting business develops almost as a sub-plot in the books. The novels become as much about the cats’ personas as the story itself. 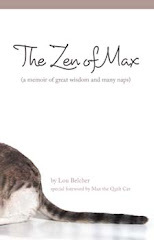 Lou: Are the cats real, or did you invent them for the novels? Stan: Scooter was our family’s first cat who left us at age 18 a number of years ago. Nugget is with us now and is four and a half years old. It’s a little bizarre but I wrote the books reflecting on exactly how each one would react to the other if they were able to speak English and did in fact work together fighting crime. Scooter would be the ‘straight man’ and Nugget the comedian. Lou: Some reviewers criticize a lot of children’s books as being too ‘preachy.’ This tends to turn middle grade kids off. How do you avoid this? Lou: Are Scooter and Nugget going to have any other cases to solve in the future? Stan: You bet. These girls are not finished fighting crime in their neighborhood. A third book in the Private Eye Cats series is in the works. Stan will be one of the featured authors at the Meet the Author Book Fair at the Eau Gallie Civic Center during Artworks. The event is on November 23 and 24, 2013, in Melbourne, Florida. Please drop by to see Stan and all the authors.